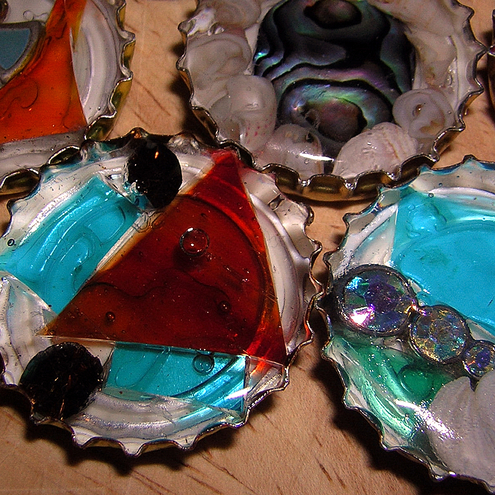 This week I have been making and then painting with frit. 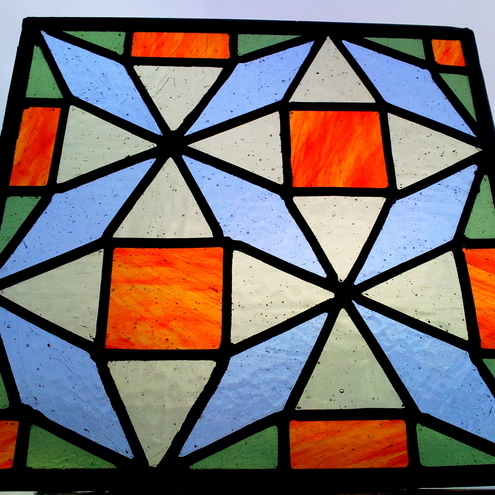 Frit is glass which has been smashed and pummeled into small fragments which can be used like paint on glass to add details or paint whole pictures. I got outside on a concrete surface (steps at back of house) with scraps of glass wrapped in newspaper and thick brown paper and smashed them to smitheries. This smashed glass can be graded into different sizes by sifting through sieves with different size holes, but for my purposes this was not essential. 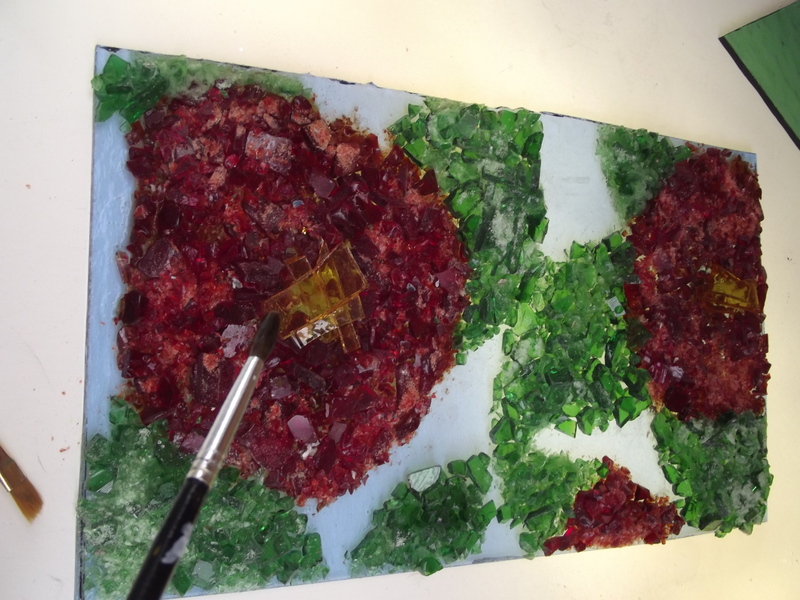 I then went about gluing these tiny bits of glass to a larger piece of fusing compatible glass base glass, to create pictures to be fired in the kiln today. My lovely love birds make excellent wedding gifts! My new design for the summer was launched at the Craft Hub Spring fair last weekend and I already have several custom orders for summer wedding gifts! 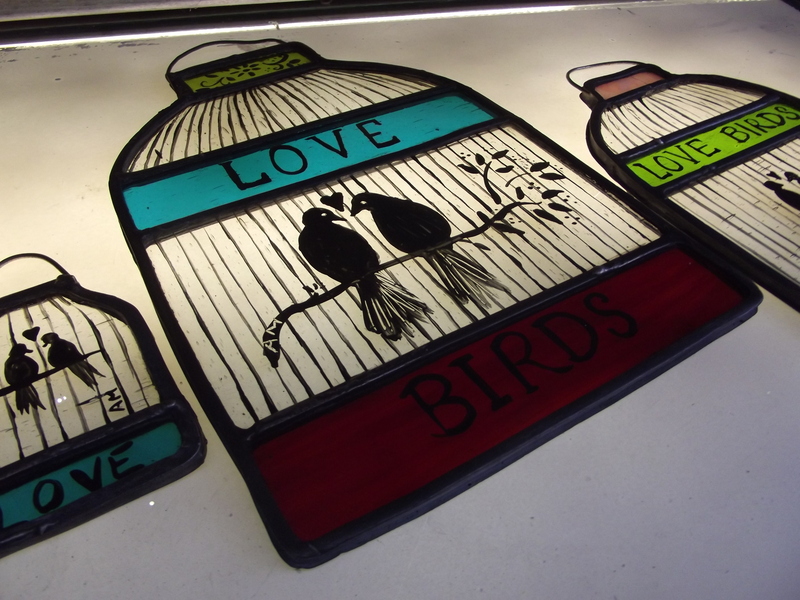 So the new design is a vintage style bird cage with 2 hand painted love birds sitting in it on clear, seedy glass.All made using traditional leading and painting techniques, just like church stained glass windows, these panels are fresh and contemporary and will look great in any home. 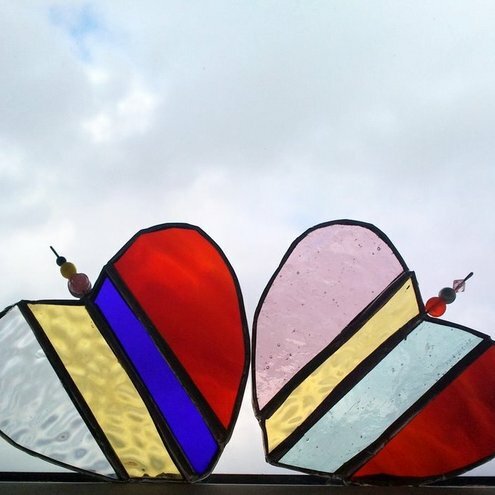 On my first batch I have painted the words love birds into the coloured glass areas and they are perfect for any sunny window; however, they come into their own when the love birds inscription is changed to the names of a happy couple for a wedding, engagement or anniversary. 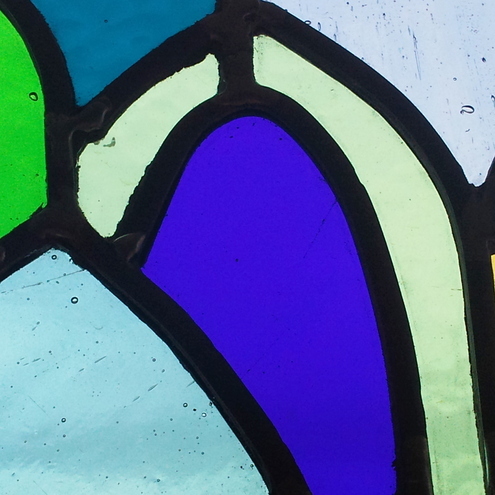 I can also make these in any colour, one of my current commissions is to use blue and yellow glass as this is the colours of the brides favourite football team! Fancy one? I have 3 sizes for every pocket, from £45 to £8. Have I solved your present problems? Then order one off my website or my folksy shop!